Pirates Ahoy! ;Decorative Wall Scroll ; This fun and playful wall scroll stands out compared to your typical poster! 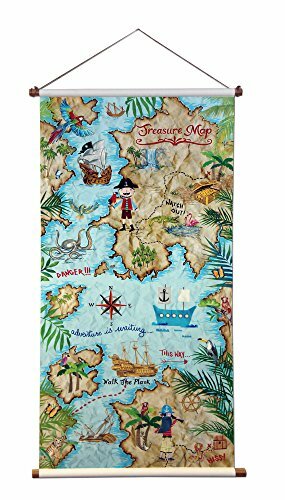 The scroll features ;pirates, pirate ships, birds, treasure chests and more over a pirate map in bright colours. Make your child's bedroom the coolest one in town when you complete the look with the rest of Art house's Pirates Ahoy collection, which include pillows, wallpaper and more! ; Check out the rest of Art house's home decor collections: Adult Collections ;Boutique This ;collection features textured damask, glitter stripes and metallic plains, all in colours such as glamorous gold's, blacks and reds. All wall coverings co-ordinate with a stunning range of Mirrors, Art, Cushions and Room Dividers Glitterati ; A splash of sparkle, a glow of shimmer and a reflective shine, all glistening with Glitter. Over ;18 shades of light catching, attention grabbing, embossed glitter vinyl wall coverings! And Much More! Children's Bedroom Collections Circus Fun Jungle Mania ; Paris with Love ; Pirates Ahoy ; Dino Doodles ; And more! ; Art-house LTD Art-house Ltd is a UK based home manufacturer and one of the leading suppliers of interior solutions with collections focusing on wall , canvas wall art, framed wall art, wallpaper, animal heads, accessories, coving and tiles, cushions, mirrors, our signature Stag heads and more! Very well known in the interior design community, Art-house can now be part of your everyday accent home with their coordinated collections. Since 2000, Art-house has been designing trend led product for the interiors market. The in-house design studio has created collections inspired directly from the most current trends. The way we style our home today has become so important to us and we recognize that we demand a lot from our places of retreat. Whether it is a stage on which to entertain, a sanctuary at the end of the day, or a more practical place to work, there will be a collection or product from us that will bring that little injection of colour and design into your home &dash; without breaking the bank! SIZE: Wall hanger measures 47" x 24"
INTERIOR DÉCOR SOLUTIONS: One of the UK's leading interior décor solutions with fantastic Wall Art collection, Mirrors, Animal Heads, Stag heads, and more! If you have any questions about this product by Arthouse, contact us by completing and submitting the form below. If you are looking for a specif part number, please include it with your message.